(PhysOrg.com) -- Researchers in the US, China, Korea and Singapore have collaborated to develop flexible ultra-thin sheets of inorganic light emitting diodes (LEDs) and photodetectors for implantation under the skin for medical monitoring, activating photo-sensitive drugs, and other biomedical applications. The research, led by John Rogers of the University of Illinois at Urbana-Champaign in the US, and published today in Nature Materials developed flexible arrays 2.5 μm thick and 100 x 100 μm square, which is much smaller than any commercially available array. 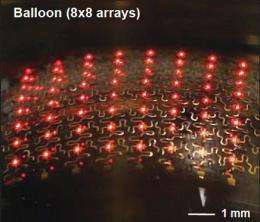 They printed circuits directly onto a rigid glass substrate and then transferred them to an inexpensive biocompatible polymer called poly(dimethylsiloxane) (PDMS) to create a mesh-like array of LEDs and photodetectors. The PDMS substrate is flexible enough that the circuits can still function even if twisted or stretched by even as much as 75 percent. Rogers said most research has concentrated on organic LEDs (OLEDs), which are extremely sensitive to water and oxygen, but the flexible arrays are encapsulated in a thin layer of silicon rubber, which makes them waterproof and allows them to function well when implanted or completely immersed in biofluids. The design also eliminates the mechanical constraints normally imposed on such devices by the inflexible semiconductor wafers that support them. The researchers successfully tested the LEDs by integrating a sheet into the fingertip of a vinyl glove, which they then immersed in soapy water, and they have also implanted an array beneath the skin in an animal model. Potential biomedical applications for the LEDs include implantable patches for monitoring wound healing, for use in diagnosis or spectroscopy, or to control the delivery of drugs triggered by light in photodynamic drug therapy. They could also be used in light-emitting sutures or implantable illuminated plasmonic crystals, and may find application in robotics. Rogers has recently founded a company in Cambridge, Massachusetts, mc10, to work on commercializing the new technology, which is a goal he regards as "incredibly appealing." Rogers said he wanted the technology to have an impact, and that was the end goal serving as the motivation for the work. Thats what I'm saying, this opens up a whole new door to body mod. Beyond body-mod. We're talkin' video tattoos and cuttle-fish people. Get this thing wired to respond to your brain waves and make yourself into the perfect ninja. Of course, you'd have to shave off all your hair and go naked all the time for that to work. Of course, you'd have to shave off all your hair and go naked all the time for that to work. Finally a good reason to do it. Caffein powered, just like the rest of me! I'm waiting for the glowing tattoos that use body heat for energy. I'm not in the mood for getting cyborganized with OLED implantation. Next thing you know, they're shooting you up with nanobots, so you become a technology dependent cyborg. I don't want any "Borg Queen" telling me what to do. To me this is the coolest part of the article. Assuming you could remotely trigger the lights somehow we could have remote controlled drug delivery at very specific locations in the body. I'm sure that Science Fiction has made an optimist out of me, but the potential uses for something similar to this seem huge. A built in display would be a nice step on human integration with machines. Imagine: a wristwatch literally in your wrist, reading texts on the back of your hand, it could be synced with implanted measuring devices so that you could constantly monitor your own vitals. OH..... i cant believe i found this... i live in New Hampshire and if at all possible i would SO love to volunteer to be the first person to have these LEDs implanted.. backlighting the tattoo on my foot wouldnt be a good idea too easy to damage but my other one probably wouldnt be too hard for them to do..